I thought this review of Tamam may never come to be. Each time I visited this place, I walk away impressed with the food but some sort of mishaps occurred to prevent me from posting about it. Whether it was a lighting, phone or photo malfunctions, this write up is a year in the making. The silver lining in all this is I’m sure that Tamam serves great food and recommend it whole-heartedly. I’m going to amalgamate all my visits into this one post so if you notice some differences in the photos that’s why. To be honest I’ve never heard of Palestinian cuisine before. 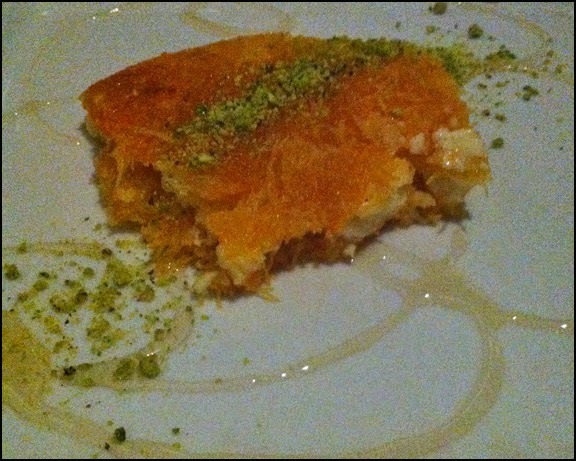 After my multiple visits, I found it similar to Greek, Turkish and Persian food. This isn’t surprising given these cultures have had ties since Homer’s time (not Simpson, unless you’re thinking about the time he was Odysseus – I’ll count that). The dishes are simple and hearty but Tamam’s food is more complex tasting than your average Greek food in Vancouver. Whether it is high end or homey meals, I really enjoy dishes created with contrasting flavours and Tamam’s food delivers that. The Smoky Mutabal dip is made with grilled eggplant, tahini, garlic and olive oil. The blended concoction is creamy and smoky. The eggplant was nicely prepared, as it didn’t have that astringent taste that aubergine sometimes can have. 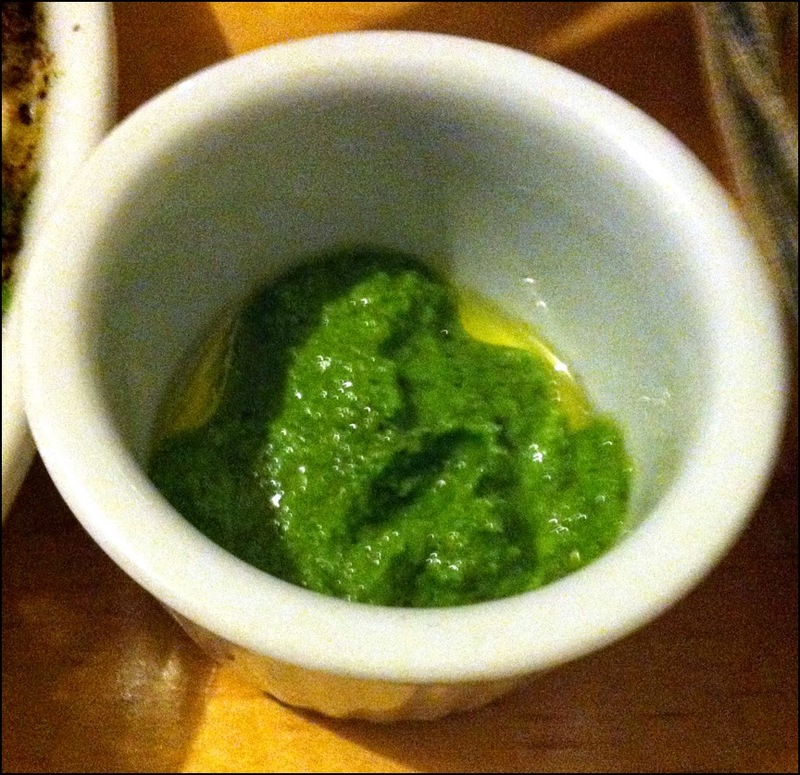 The chopped parsley, instead of just being a garnish, actually lends a nice herby and fresh taste to offset the rich dip. In addition, I think the purple spice on top is sumac, which is naturally sour and gives the dip another dimension. 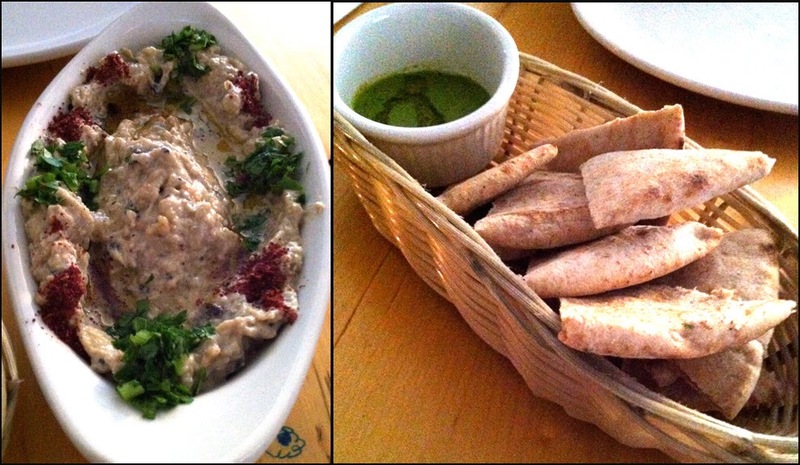 Served with pita wedges, the Mutabal dip is a nice appetizer to start a meal. The restaurant serves a homemade and deceptively hot sauce. First off it’s green so usually I associate it with a milder taste but not here. Use with caution. At Tamam, two unique carb items, the Mujaddarah and Freekeh, take the centre stage instead of the proteins. The Mujaddarah (upper left corner in above picture) is a rice dish cooked with lentils and caramelized onions. I could have eaten this all by its self. This soft mound of rice doesn’t look like much but it’s packed with flavour. The lentil makes this dish more substantial and provides a layer of earthy flavour. The onions provide an appetizing aroma and sweetness to the Mujaddarah. 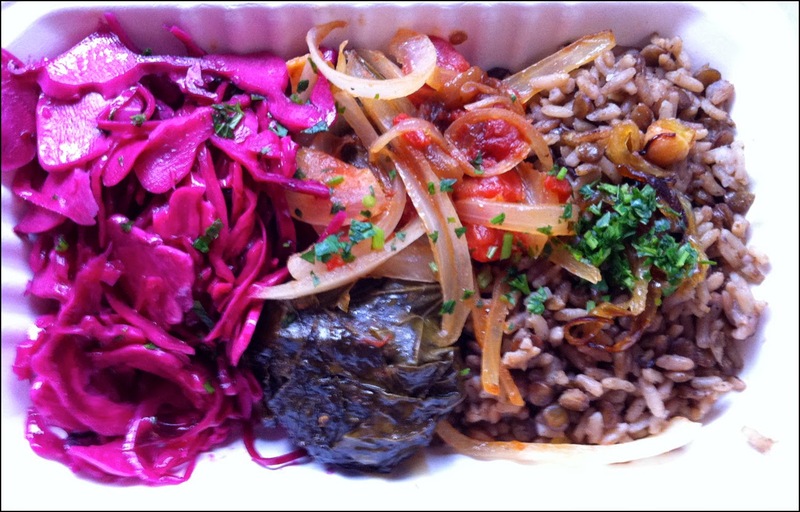 In contrast, the Freekeh (upper left corner in above picture) is simpler and lighter in taste. The dish is just cooked toasted green wheat. I found it just had slight sweetness that some grains have but not the smokiness that this grain is known for. However it does have a more interesting texture than the Mujaddarah as some of the kernels of wheat were al dente. With both grains you have the option of either lamb or chicken. 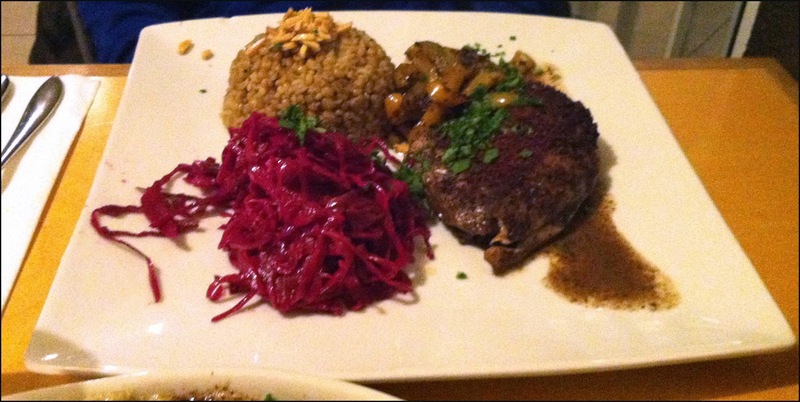 I would recommend the chicken (in the freekeh pic). The lamb is tender, seasoned well, and served with peppers and onions, but it’s cooked to a done level and not really note worthy. The slow baked chicken I found more interesting. Tamam serves bone-in dark meat with the skin on. The meat as a result is more flavourful and tender. The skin is rendered and there’s a tasty spice sprinkled on top of the chicken, which has crisped in the cooking process. All dishes are served with a vibrant purple cabbage salad. The crunchy veggie is dressed in simple olive oil and is very tart. On its own it is overwhelming. However when eaten in conjunction with the other elements of the plate, it acts as a nice counter point to the heavier flavours of the meat and Mujaddarah. It was a very interesting combination of flavours with both the salty gamy goat cheese and the sweet rose water syrup competing for your attention; in addition, it looks like a hairy carrot landed on your table. As odd it may look, sound and taste, I just kept on eating it and before you know it, the dessert was gone. It’s sneaky good. Lastly, one of the ways I determine whether or not to visit a place for a write up is I grab take out, if possible, first. The item I grabbed from Tamam was their Warak. This dish reminds of the Greek Dolmades and I honestly think it’s basically the Palestinian version but served with a tomato sauce instead of the Greek lemon sauce. This baked beef stuffed grapes leaves is served with the savoury Mujaddarah and tart purple cabbage salad. 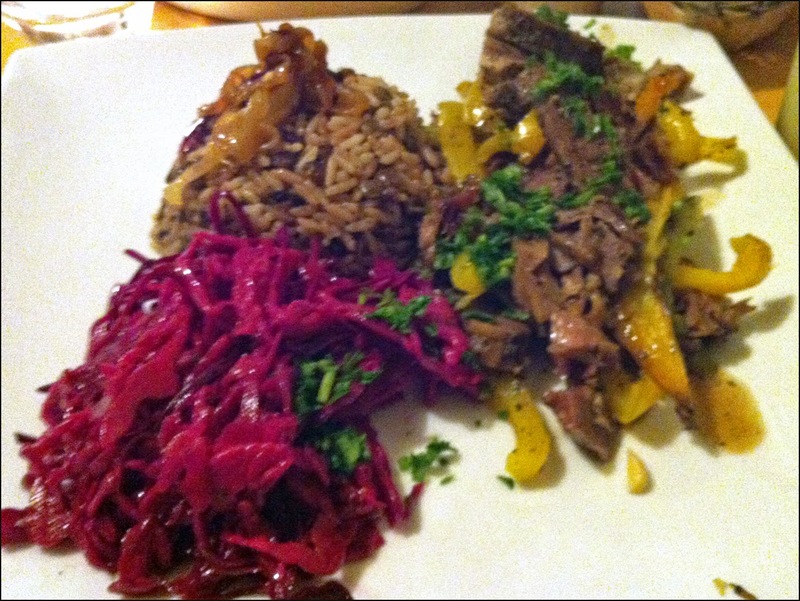 The beef filling was coarse, seasoned well and had bits of parsley. The tomato onion sauce brightened up the dish. Overall the dish was very hearty and satisfying. It was a great experience exploring Palestinian food. I enjoyed the hearty, simple and delicious food from Tamam and will return as much as I can; this is an interesting alternative to the stale Greek food in the city.